(Source: City of Evanston) A screenshot from the video of the arrest of Northwestern graduate student Lawrence Crosby in 2015. The video was released publicly after Ald. Brian Miller (9th) requested it at a City Council meeting this week. The city released a video Wednesday evening showing the 2015 arrest of Northwestern graduate student Lawrence Crosby, showing Evanston police kneeing him and punching his legs. Crosby, a PhD candidate in McCormick, was arrested on Oct. 10, 2015, after someone mistook him for stealing a car that he owned. He was charged with disobedience to police. Following the dismissal of his charges at trial, Crosby filed a lawsuit against the city, which is ongoing. 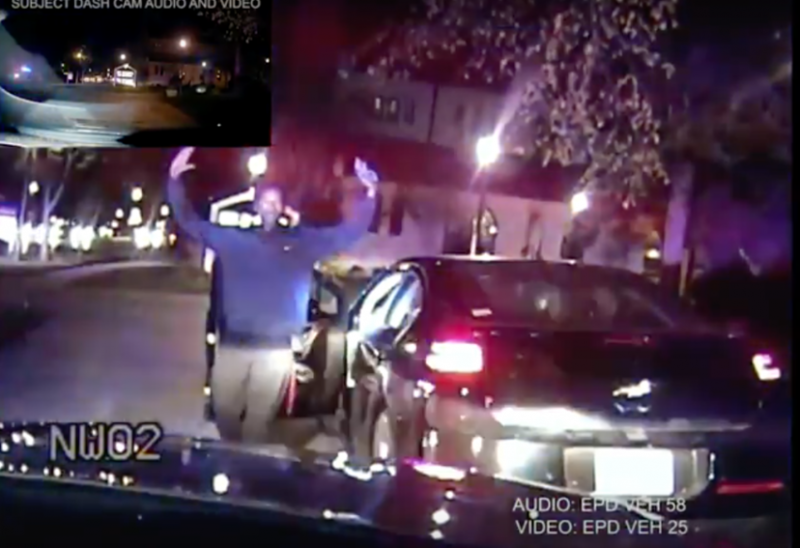 The Evanston Police Department released the video, which compiles footage from Crosby’s personal dashboard camera, police dashboard cameras and audio recordings of the 911 call that prompted the arrest, as well as conversations between police officers. In an opening segment, Sgt. Dennis Leaks justified the use of force by police, saying it complied with police procedures. On the night of the arrest, a 911 call was placed to EPD by a woman who reported a man was breaking into a car. That man turned out to be Crosby, who is black, and the car was his own. When he heard the woman honk her car horn at him repeatedly, he got into his car and drove away. The woman followed him in her own car and informed police of where he was driving. Police then pulled Crosby over and he exited his car unprompted, with his hands in the air and a cellphone in his hand, according to the video footage and police reports. Police ordered Crosby to get on the ground. He refused and was forced on the ground. According to Leaks’ statement in the beginning of the video, officers then struck Crosby with knee strikes and punches to the upper thighs. Crosby was eventually handcuffed by officers and arrested. The graduate student was arrested and charged with disobedience of police. The charges were later dismissed in court. City manager Wally Bobkiewicz said in an email that a Freedom of Information Act request was submitted in December by a third party asking for the release of video of the arrest and other information on the matter. The city released the reports and video taken by Crosby’s camera on its FOIA portal, and due to technical issues, sent the second video out on a compact disk, Bobkiewicz said. The intended recipient of the disk did not appear to have received the video. When Crosby’s dashboard video was originally published on the FOIA portal, it was not made available to anybody but the petitioner. The city made the video public on Wednesday at the urging of Ald. Brian Miller (9th). The second video was posted on the City of Evanston’s YouTube channel following another request from Miller, a mayoral candidate, to make all video footage public. Miller requested the video at Monday’s City Council meeting. He urged for the release of the video as part of a broader discussion of police issues which have been spoken about at Human Services Committee meetings for the past few months. In an email to The Daily, Bobkiewicz said he and police chief Richard Eddington would present policy and procedure changes at a Human Services Committee meeting next month. Committee members requested the review in September after hearing a report from Dr. Gilo Kwesi Logan on EPD’s current policies and procedures. Clarification: This article was updated to clarify the dismissal of the initial charges filed against Crosby and the events of his arrest.